Hiring a personal injury lawyer is an important decision. Hopefully, this will be the first and last time that you will ever have to be involved with the legal system due to someone else’s careless acts which caused you to suffer injuries. You want your personal injury attorney to have experience in not only settling lawsuits but trying lawsuits that involve personal injuries or death in a car or automobile, motorcycle, slip and fall or trucking accident. While accidents and wrecks may happen every day, you want a lawyer who is used to trying this type of lawsuit in front of a jury. 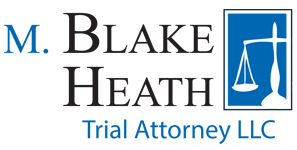 At M. Blake Heath Trial Attorneys LLC, we have extensive trial experience. When selecting your personal injury attorney to handle your accident, be sure to do more than just look at the phone book. Look to see what results this attorney has gotten in the past. While previous results are no guarantee of a similar result in your case, you will want to know if that lawyer has tried million dollar lawsuits and won. If you are interviewing a lawyer, ask that lawyer about their trial experience, their jury verdicts, their awards, and their ability to handle your case. We encourage you to review the “Verdicts and Settlements” page of our website which describes many of the cases we handle. You will see that we have experience with a variety of personal injuries and accidents. Another important aspect of hiring a law firm is to look at their staff. You will want to know if there are paralegals and other individuals on the staff who are dedicated to working closely with you, keeping open communication, and being available to answer your questions. At M. Blake Heath Trial Attorneys LLC, we have outstanding paralegals who have trial experience and have worked in the industry for decades. Sometimes phone books or the internet lists referral services. It is important to know that people pay to be listed in a referral service and simply being listed in a referral service does not mean the law firm is qualified to handle your case. You want a personal injury attorney who has handled accidents like yours and who has obtained sizeable jury verdicts and settlements. A lawyer listed with a referral service does not automatically guarantee you will get that type of personal injury lawyer. Hiring your personal injury lawyer to handle your accident or wreck is an extremely important decision. Do not take it lightly. Do the research and ask the hard questions before signing a contract. Most personal injury attorneys work on a contingent fee basis which means the attorney only gets paid if there is a settlement or verdict. At M. Blake Heath Trial Attorneys LLC, we advance the expenses to get your case to settlement or verdict so you do not have to come up with any money in order to pursue recovery for your personal injuries. If you have questions about hiring a personal injury attorney for your wreck or accident, please contact our firm for a free consultation. Call 816-931-0048 NOW, For Your Free Personal Consultation!